And would we be home. Alas, no tea pot and I'm not sure that there was even a teapot made. I especially like the cups for they're nice big ones. Great for tea with a friend. 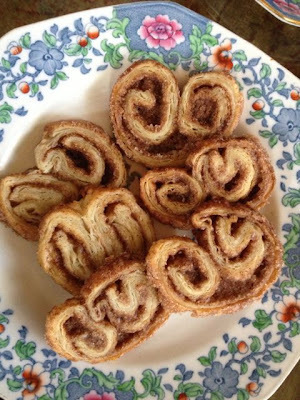 An easy dough of yogurt, flour and butter, filled with cinnamon sugar, rolled and baked. They're a great tea cookie! They remind me of palmiers. In a small bowl, stir the sugar and cinnamon together. Put the flour and butter in the bowl of an electric mixer and mix on low speed until the butter is in pieces the size of small ima beans. With the mixer running, add the sour cream and vanilla and mix just until the dough holds together. Gather the dough together and pat it into a flat rectangular shape. Transfer the dough to a lightly floured work surface and using a floured rolling pin, roll it out to a 18 by 16 inch rectangle with the short side facing you. Leaving a 1 inch bare edge along both long edges and reserving 1 T. of the cinnamon sugar, sprinkle the remaining cinnamon sugar evenly over the dough. Beginning at the bottom edge, roll the dough up tightly, but stop when you reach the halfway point. Then, beginning at the top, roll the dough tightly toward the center until the second roll meets the first one. Pinch the seem along the length of the roll to seal it tightly. Pinch the ends to seal them tinghtly. Sprinkle the reserved cinnamon sugar evenly over the folk and roll it back and forth to coat the outside with cinnamon sugar. Wrap each piece in a piece of plstic wrap. Refrigerate for at least 3 hours or overnight, until firm. When ready to bake the cookies, position a rack in the middle of oven. Preheat the oven to 350. Line two baking sheets with parchment paper or a silpat. Use a large, sharp knife to cut each cold log into 18 slices. About 1/4 inch thick. Place the cookies 1 inch apart on the baking sheet. Bake the cookies, one sheet at a time just until brown, about 17 minutes. The cookies will spread into large open double spirals as they bake. Let cool on the baking sheet for 10 minutes. Use a wide metal spatula to transfer the cookies to a wire rack to cool completely. Such a pretty variety of flowers on that china. Perfect tea setting as always. What a pretty set of dishes. Looks like a lovely table! The tea spirals look SO good! And I love your tea set. How special that your friend came for tea. I like tea in the living room too. I also like a nice big china tea cup when I'm very thirsty. 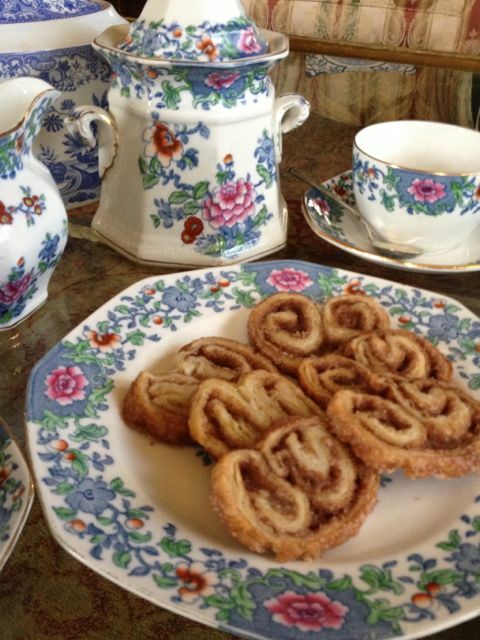 The china has a pretty pattern and the spiral cookies look delicious. I miss having a coffee table in the living room for occasions like this. What a pretty tea set. 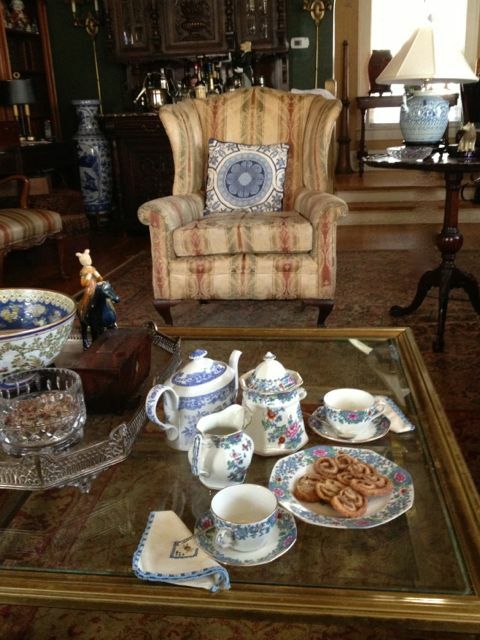 I enjoy tea in the living room because I prefer a soft chair. My coffee table gets a lot of use. Your spiral cookies look delicious and thanks for the recipe. As always, it's a pleasure to have you join me for tea. Have a beautiful day. 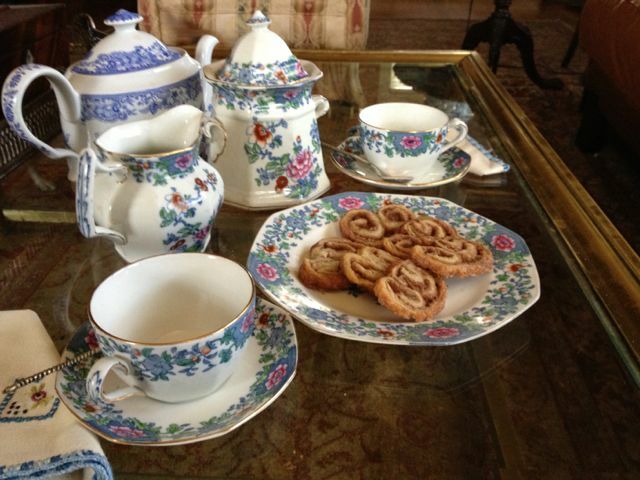 Hi Martha, lovely tea set and great idea to have tea in the living room. We did the same thing ourselves today. We tend to chase the sun around the house here in the Pacific Northwest...lol. Hugs and have a lovely day. I keep telling myself I am going to make this cookie, thanks for the reminder. Would love to sit just there in that chair and have tea. Oh my, I love, love that china pattern. So pretty. Your spirals look fabulous. I must try and make them. Bet they are as delicious as they are attractive. What a welcoming home and tea. Love that china pattern.. Such a lovely tea for a special friend. Beautiful Chine pattern! Enjoy your tea party! I agree...tea can be taken anywhere, dear friend!!! What a gorgeous tea setting @ Linderhof in your living room!!! Waiting for the return of Spring weather here on our side of the Prairie for Tea on the Deck!!! Your cookies look amazing. Anything with cinnamon is a hit in this house. Love your china, Martha. So pretty.